Vadodara, formerly known as Baroda, is the third largest and most populated city in the Indian State of Gujarat, after Ahmedabad and Surat. It is the administrative headquarters of Vadodara District. It is located on the banks of the Vishwamitri river, southeast of Ahmedabad, 139 km from state capital, Gandhinagar. Both the railway line and national highway connecting Delhi and Mumbai pass through Vadodara. According to historians, Vadodara's history is over 2,000 years old and the city has been ruled by Hindus, Pathans, Mughals and Marathas. The city houses different language speaking populace such as Gujarati, Hindi, Marathi and English. Baroda saw the settlement of traders during 812 AD and was dominated by the Hindu kings until 1297. During the early years of the Christian era, the town was ruled by the Gupta Empire and was taken over by the Chalukya Dynasty. With the spread of Muslim rule in the country, the city was ruled by the Delhi Sultans who were later overthrown by Mughal emperors. Finally, the Marathas took over the region from the Mughals. The best way to get around Vadodara is by an auto rickshaw. Apart from exploring tourist hotspots like the Laxmi Vilas Palace, Pratap Vilas Palace, Maharaja Fateh Singh Museum, Aurobindo Ashram and the Walled city among other attractions, tourists can also visit the MG University, which has made Vadodara one of the most sought-after educational hubs in the country. Tourists visiting Vadodara can also visit the various shopping malls the city boasts of or indulge in some street shopping. They can shop for handicrafts, textiles and leather products from the various bazaars in the city, especially Nava Bazaar. As for eating out, apart from restaurants, street food available near MS University is worth a try. Hawkers serving egg dishes, vada pav and Indian-Chinese delicacies are quite renowned. As the geographical location of the city is close to the Thar Desert, the city has tropical savannah climatic conditions. The summer temperature ranges from 45⁰ Celsius to 24⁰ Celsius. On the other hand, the winter temperature ranges between 31⁰ Celsius and 11⁰ Celsius. Keeping weather conditions in mind, the ideal time to visit Baroda is during March and April. The first noted history of the city was of the early trader settlers who settled in the region in 812 AD. The province was mainly Hindu-dominated with Hindu kings ruling till the year 1297. The Gupta Empire was the first power in the region in the early years of the Christian Era. After fierce battles, the region was taken over by the Chalukya Dynasty. Finally, the kingdom was annexed by the Solanki dynasty. By this time the Muslim rule had spread across India, and the reins of power were then snatched by the Delhi Sultans. The city was ruled for a long time by these Sultans, until they were easily overthrown by the Mughals. The Mughals biggest problem were the Marathas who eventually took over the region. It became the capital of the Maratha Gaekwads. Shiv Bhatt (1875–1939), a most successful ruler, made many public and bureaucratic improvements in the region. Although the British had a major influence on the region, Baroda remained a princely state until Independence. Like many other princely states, Baroda also joined the Dominion of India in 1947. Baroda(Vadodara) Tourism - Get all information on Baroda(Vadodara) tourist places and sightseeing tours. Our website helps you plan your next tour and gives you great ideas on what to do, where to eat, where to stay and when to go there. We give the best information from the web to give you precise, meaningful and useful travel guide for leading places to visit in India and from across the world. Our travel information on BARODA(VADODARA) tourist places, tourist attractions, major sightseeing, the best time to visit, the top places to visit in Baroda(Vadodara), the must-see things to see and do, maps, restaurants, hotels, nearby tourist destinations, local public information and more. 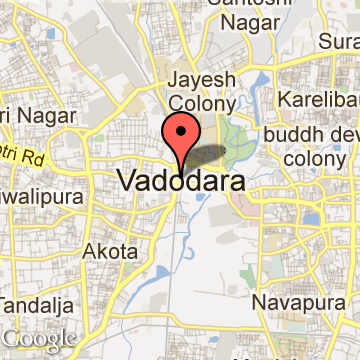 To start with check out information on how to reach Baroda(Vadodara).